Of course, when one visits Turkey, you can plan to eat well. 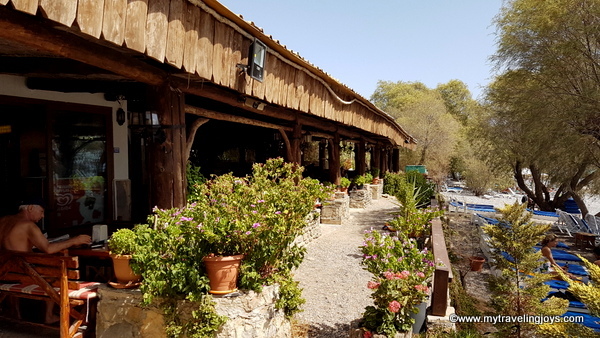 I thought I would share some of the special dishes and places I visited during my trip to Bodrum, a beautiful resort area located on the southwest peninsula along the Aegean Sea. On the first night in Bodrum after the 3rd Annual Karaova Grape Harvest Festival had kicked off with traditional Aegean dances, we ate dinner at a lovely restored, 160-year-old stone house called Avlu Bistro & Bar. The restaurant has two levels inside and plenty of outdoor tables so you can enjoy the pleasant summer weather. 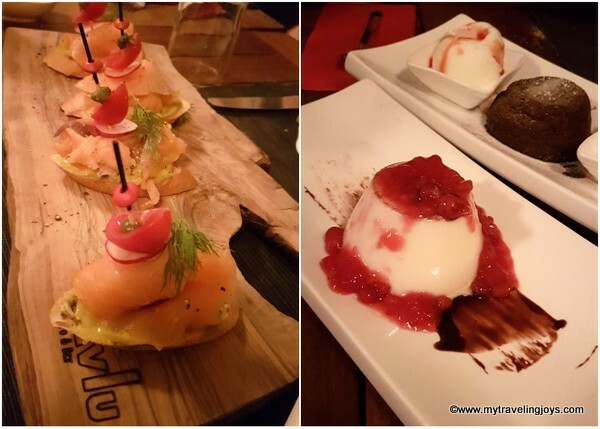 Here, we started off with several mezzes including smoked salmon bruschetta, veal carpaccio, Turkish olives, cheese, etc. Every dish was delicious, but to me, the real highlight was the main course – the çökertme kebabı. 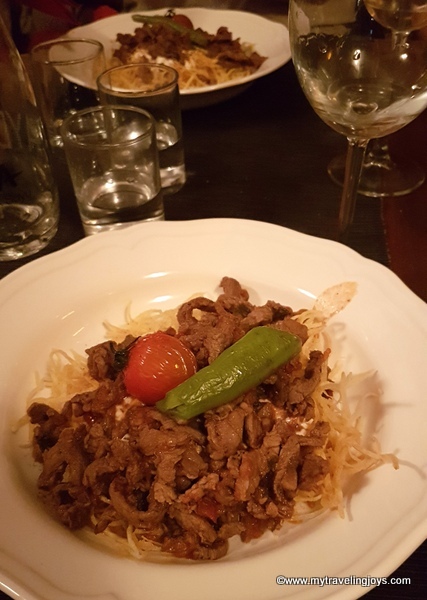 This traditional Bodrum dish features tender steak (bonfile) served atop fried shoestring potatoes in a yogurt and tomato sauce. OMG! As a meat lover, I was in heaven! Somehow during my previous trips to Bodrum, I had missed out on having çökertme kebabı. Never again! If you love steak, then you must try this amazing dish when you visit the Bodrum area. For dessert, we had a warm chocolate soufflé cake and a panna cotta with berries. After dinner, we walked along Bodrum’s famous Barlar Sokak and headed back to our hotel to relax. 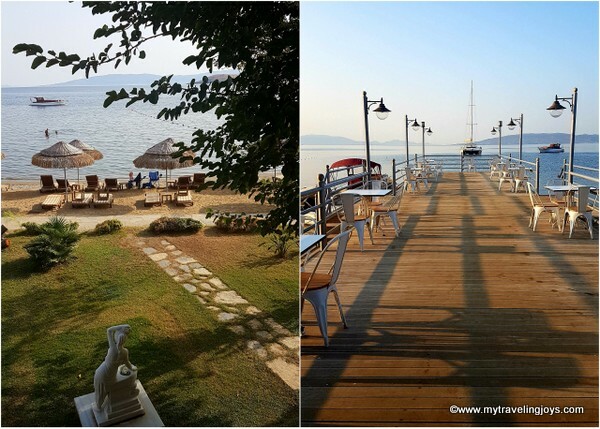 In the mornings, I enjoyed a full Turkish breakfast buffet at Hotel Marma Beach, a small, boutique hotel located on Ortakent Beach. I had a second-floor bedroom here with a small terrace where I enjoyed sitting out in the late afternoons with a glass of Turkish wine. 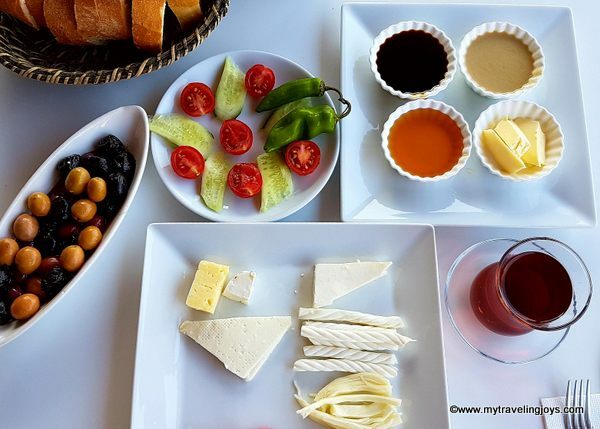 A traditional Turkish breakfast often features several kinds of cheeses, breads, olives, fresh tomatoes and cucumbers, boiled eggs and teas. Simple and delicious! 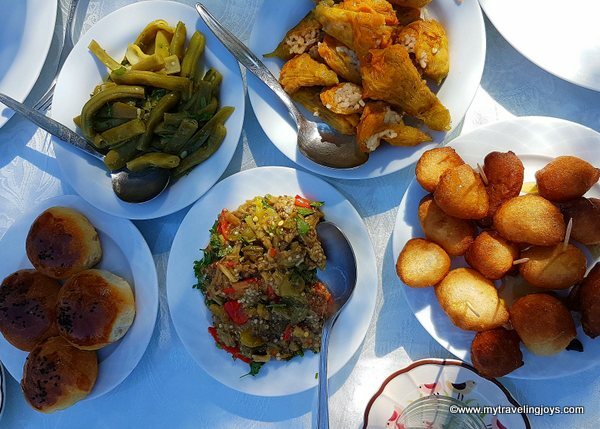 Of course, I can’t forget the amazing köy kahvaltısı (village breakfast) that I enjoyed with my new Turkish friends in the countyside at Etrim Doğa Restaurant & Köy Kahvaltısı. 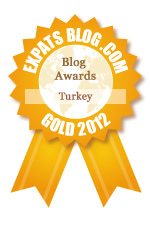 To read more about that experience, please read this post: Enjoying a Turkish Village Breakfast Near Bodrum. For lunch, we ate at a small family restaurant in Mumcular called Kavurmacı Celal Usta. Often, small restaurants in Turkey will specialize in cooking and serving just one or two dishes. In this case, we were interested in eating saç kavurma. Kavurma usually refers to beef or lamb simply seasoned and cooked in its own juices and fat. Another traditional way to prepare kavurma is to cook it on a metal pan called a saç. The saç is placed over an open fire and the diced lamb or beef is stirred around and cooked with a large metal spatula until the meat releases its juices and fat. Our dish was served with lettuce, freshly diced tomatoes and bread. Of course, the drink of choice here is ayran – a salty, but refreshing Turkish yogurt drink. 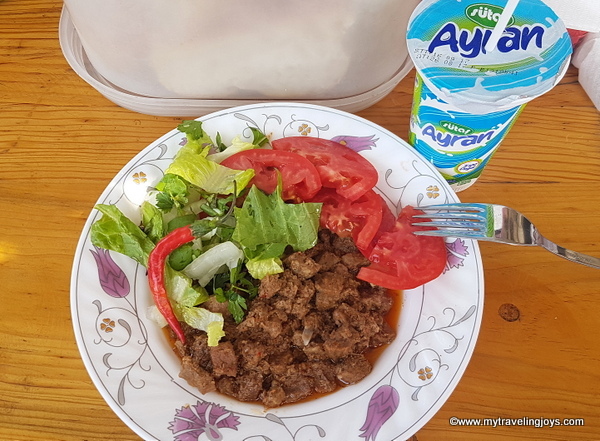 Ayran also goes well a really spicy meal. Trust me. Unfortunately or perhaps fortunately, I often didn’t know where I was going on this trip since I had very limited wifi and my brain was constantly working away at my lost Turkish language skills. After leaving Mumcular, I know we drove south toward the Göltürkbükü Mahallesi. I have since learned that we stopped for afternoon tea at Hasan Restoran, a family-owned restaurant/motel located on the beach. 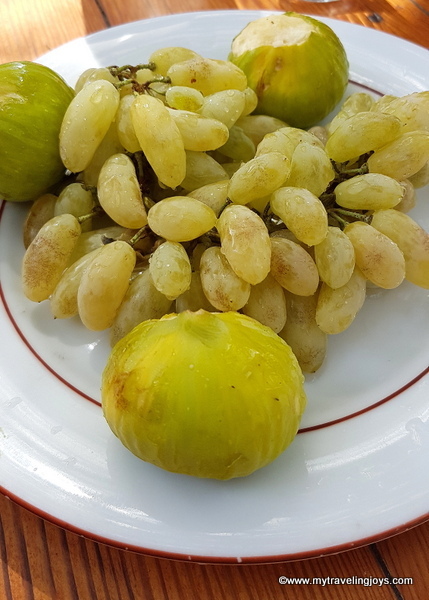 We dined on chilled, locally-harvested grapes and figs while enjoying the seaviews in the afternoon sunshine. 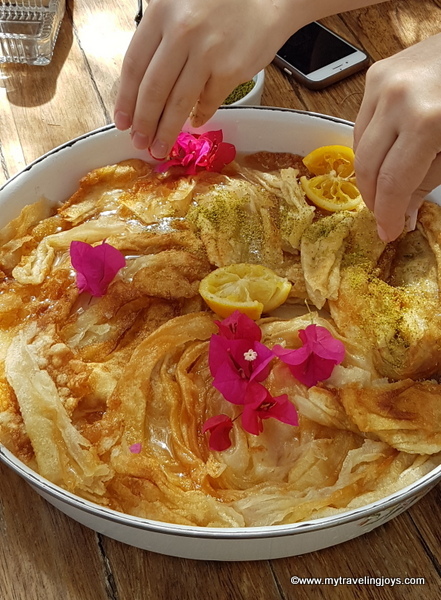 But the highlight here was eating Saraylı Tatlısı – another Bodrum specialty which is thin sheets of yufka (phyllo dough) baked in a sugary syrup and topped with chopped pistachios. If you like Turkish baklava, then you will love Saraylı Tatlısı as well. 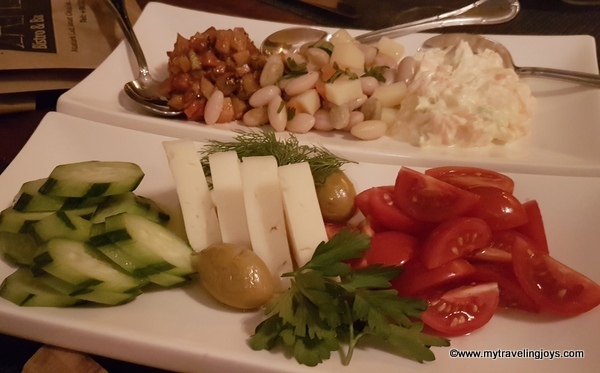 Whenever you travel to Turkey, I promise that you will eat well – be it a large city like Bodrum or Istanbul or the tiniest of Turkish villages. Again, special thanks to Karaova-Der, Slow Food Bodrum and the Bodrum municipality for making this wonderful Turkish trip happen! You packed plenty into your long week-end. I've journeyed with these bloggers myself and know that they are on the go from early morning until late late. I love Turkey and enjoy your posts! I am wondering if you have been in Turkey recently? I am wondering how safe it is to travel there. Have reservations to go there in March (2018) and am hoping you feel it is safe. Turkish cuisine is known for its richness and complexity, a result of Anatolia’s multifaceted history. The different climates, geography and cultures have all played their part in shaping the regional cuisines of Turkey.